While NHL 97 looks very bad compared to subsequent EA hockey games, for its time the game was a real leap forward from the 16-bit generation. The players are all large and fully polygonal, but the low polygon count takes away a lot of the detail. The glass over the boards looks more like a window screen, but the boards themselves are covered in advertisements which helps add to the realism of the game. Some of the proportions in the game seem off, such as the ice being too small and the nets being too narrow. The crowd noise is nearly nonexistent, making you feel like you’re playing in an empty arena, but the sound effects are quite good. I especially like the sound the puck makes when it hits a post. The game has no play-by-play or color commentary (the NHL series would get that the following year), and instead has John Davidson acting as both the arena announcer and commentator, but he only shows up before and after the game and during intermissions. His comments are all done using full motion video, and due to the relatively small number of videos his comments are always vague and often out of place. This is a shame because John Davidson is a great color commentator, and it would have been nice for his talents to have been put to better use. Still, it had a cool “wow” factor in its day. 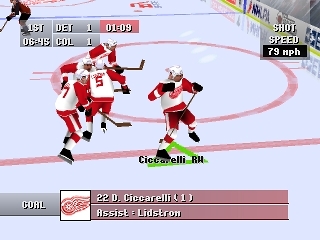 Continuing the style of the latter 16-bit games, NHL 97 is fast-paced. Skaters zip around the ice quickly and deliver hard body checks. Shots are for some reason very slow, unless you take the time to really wind up first. The games responsive controls and crisp passing make it fun to play, and I only get frustrated when my goalie lets in a softie, which unfortunately happens more often than it should. I love stat tracking, and this game offers plenty of it. Like most hockey games, it offers exhibition, full season, and playoff modes, as well as player creation, trades, and free agent signings. It also includes a shootout mode which can be useful for practicing breakaway shots and manually controlling your goalie. Among the multiple camera angles available is a helmet cam which while not very useful is cool to check out in that it was not possible on the 16-bit systems. NHL 97 is easily the worst 32-bit game in EA’s NHL franchise, but I would still much rather play it than any of the 16-bit iterations. Buy NHL 97 on GameGavel or Amazon. Tagged 1996, EA, Hockey, NHL, NHL 97, Playstation, PSX, Review, Sony, Sports. Bookmark the permalink.